When you decide to hire an Iceland car rental, there are several things you need to know. Even if you’re an experienced driver, driving in Iceland might be different than you’re used to back home. Everything from F-roads to weather to road conditions and even hills and corners that block your view of oncoming traffic can make this a whole new driving experience. What’s the speed limit in Iceland? And how long does it take to drive around Iceland’s Ring Road? Let’s cover some of the most commonly asked questions that pop up regarding driving in Iceland and Iceland car rental. As a renter, you’re expected to return the car in the same state that it was when you picked it up. This sounds very obvious but you’d be surprised at how many people get into tricky situations due to being naive or simply not knowing any better. Driving in Iceland - Is it Dangerous? This is a question that comes up quite frequently. I wouldn’t necessarily say that driving in Iceland is risky per se, but it’s definitely different for several reasons. When you have an Iceland rental car, you need to keep in mind that it’s a completely new environment for you. If you are a safe, cautious driver who practices common sense, then you shouldn’t have problems. Many visitors come during the summer months, but for those who come in the fall and winter, the potential for risk increases. If you’ve never driven in wintery or snowy conditions, this is where you will want to be especially careful. Black ice is no joke, and you don’t want your first exposure to it to be skidding in your Iceland rental car. 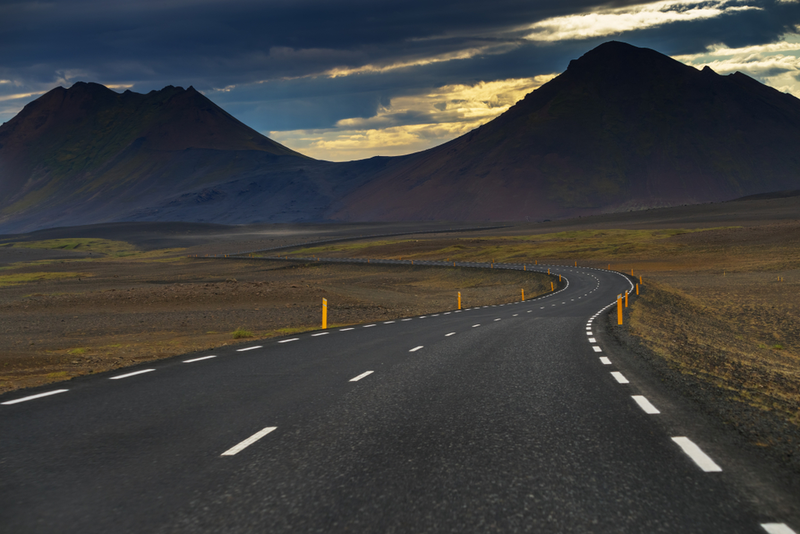 The speed limit in Iceland is 90 km per hour (56 mph) on paved roads and 80 km per hour on unpaved or gravel roads. If you’re in an urban area like a city, town, or village you have to go between 30-50 km per hour (18-31 mph). Of course, you can always go more slowly if weather conditions are bad. It takes between 16-20 hours to drive around Iceland's Ring Road, but there's no need to hurry. Take the time to enjoy your surroundings, and always stop to get out of your vehicle when taking photos. Whatever you do, don’t speed. Not only are there speed cameras that can easily catch you and give you heavy fines, but it’s also just plain foolish and unnecessary to speed in Iceland. Don’t do it! Something else that is foolish but that surprisingly happens a lot is when people approach blind hills (blindhaed) or blind corners. Due to the angle of the corner or the steepness of the hill, it’s sometimes impossible to see oncoming traffic. In these instances, it’s always better to slow down and pull as far to the right side of the road as you can. Another big factor of driving safely in Iceland are the road conditions. Again, it’s going to be more challenging outside of the summer months. Let’s look at how. You want to always check the weather forecast and Iceland road conditions before heading out, even if you’re traveling in the summer. In addition to ice and snow, there are plenty of other elements related to the harsh Icelandic climate that can wreak havoc on your rental. Ash storms and sandstorms are not uncommon, especially in South Iceland. Another issue is animals, namely sheep, darting out into the road. They are easily scared and the sound of your approaching automobile might cause them to freak out and run into the road just as you are passing by. Don’t make the mistake of thinking of them as just some scenery along the Ring Road. If you see a flock of sheep, or even a few stragglers, slow down as you drive past them. Iceland car rental companies will tell you this when you pick up your vehicle but I wanted to mention it here as well. Something else that catches many tourist driving in Iceland off-guard is when the road suddenly changes from paved to an unpaved or gravel road. It's easy to lose control behind the wheel, so always approach these change points with a slow speed. During the summer, these inland roads that lead to Iceland’s Highlands and the backcountry open up. If you’re taking an Iceland road trip in this wild, gorgeous, untamed territory, you’ll be driving on lots of unpaved, gravel roads. By law, you need to have a 4x4 car rental in Iceland (think SUVs, Land Rovers, and Jeeps) in order to drive along these beautiful landscapes. You’ll also encounter plenty of unbridged rivers, so be very careful where you cross. You’ll be responsible for any damage to your rental car from fording rivers. Do I Need Insurance on My Iceland Rental Car? I’m going to go ahead and say yes. Car rental in Iceland is unique in that damage sustained to your car can have very little to do with your skill as a driver. You’ll notice that most of the rental insurance in Iceland is related to protecting your car from the elements rather than yourself. Sand and Ash Protection (SAAP) is a must is you plan on driving along the South Coast. Gravel Protection (GP) is also necessary if you plan on spending any time on F-roads or exploring Iceland’s Highlands. There are some unpaved sections of the Ring Road but they are few and far between. Collision Damage Waiver (CDW) insurance comes standard on all Iceland car rentals. If you want extra coverage, then opt for the Super Collision Damage Waiver (SCDW) insurance. Lastly, Theft Protection (TP) will cover you in the event of theft. When you pick up your car rental in Iceland, you or someone in your party will need to provide credit card information as a guarantee. They usually won’t charge a hold or deposit; it’s more for any charges that may occur like speeding tickets. I hope this information has helped. Please remember to treat your Iceland car rental with the same care you would use for your car at home. And of course, remember to fill up your tank before returning it to the rental office on time. Happy driving.